The planned six-story, 187,000-square-foot Brigitte Harris Cancer Pavilion will be part of the Henry Ford Cancer Institute in Detroit. 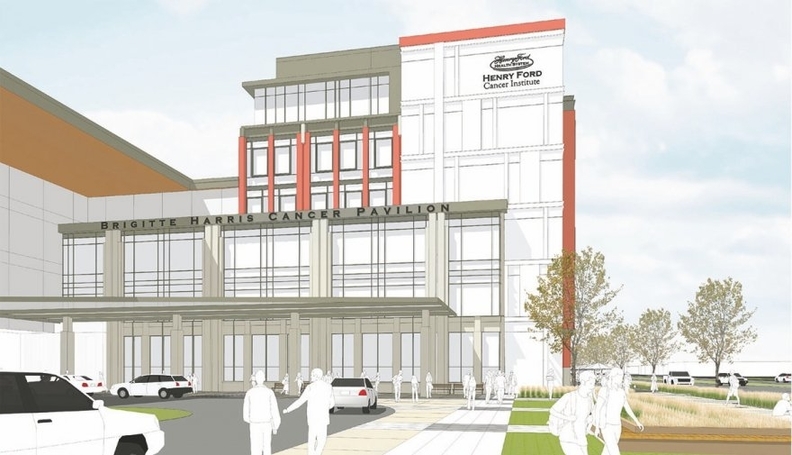 Plans are moving forward for a new cancer care facility in Detroit, Mich.
A groundbreaking event takes place Tuesday for the Brigitte Harris Cancer Pavilion, which will be part of the Henry Ford Cancer Institute. It's named for Detroit businessman and philanthropist Mort Harris' late wife, Brigitte Harris. Last year he gave Detroit-based Henry Ford Health System $20 million to facilitate cancer care and research as part of a $40 million package supporting the health system. The six-story, 187,000-square-foot Brigitte Harris Cancer Pavilion will offer ambulatory cancer treatment, precision medicine, clinical trials and support services for cancer patients. As part of the event, work will take place on "Brigitte's Garden" — an interactive art project that will become a permanent art installation. Brigitte Harris had pancreatic cancer and received care at Henry Ford Hospital. The pavilion near the hospital is expected to open in 2019.